Author J.E. Reed’s Newly Released “Falsely Accused: Our Journey to Hell and Back With Jesus as Our Guide” is a Testament to the Power of God and Faith. 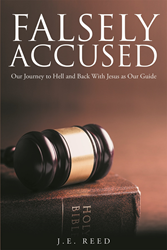 “Falsely Accused: Our Journey to Hell and Back With Jesus as Our Guide” from Christian Faith Publishing author J.E. Reed retells the author and her husband’s journey to hell and back. It is a testament to how the power of God can deliver the Faithful from the darkest of circumstances. “Falsely Accused: Our Journey to Hell and Back With Jesus as Our Guide”: a true story about the author’s journey to hell and back. “Falsely Accused: Our Journey to Hell and Back With Jesus as Our Guide” is the creation of published author, J.E. Reed, a wife of forty-two years, a mother of three, and a lover of animals. She is planning to soon retire from her seventeen-year career working with disabled school children. Living her life in order to glorify God is her ultimate goal. Published by Christian Faith Publishing, J.E. Reed ’s new book is a declaration of the magnificent power of the Living God. It was a hot July day in 2011. The household of author J.E. Reed and her husband was out of toilet paper, which was far from unusual. It was, however, the need for a simple household item and a routine trip to the store that would plummet them into the most horrendous journey of their lives. Here is how a routine trip to the store changed their lives forever. This is the true story of J.E. Reed and her husband’s journey to their own personal hell and back. This is the story of how it began, how they survived, how they escaped, and how they moved on. This is how their amazing Faith and belief in the promises of the Savior led them and delivered them from the storm. View a synopsis of “Falsely Accused: Our Journey to Hell and Back With Jesus as Our Guide” on YouTube. Consumers can purchase“Falsely Accused: Our Journey to Hell and Back With Jesus as Our Guide” at traditional brick & mortar bookstores, or online at Amazon.com, Apple iTunes store, Kobo or Barnes and Noble. For additional information or inquiries about “Falsely Accused: Our Journey to Hell and Back With Jesus as Our Guide”, contact the Christian Faith Publishing media department at 866-554-0919.